When a woman falls pregnant, she has to navigate a lot of bodily changes. While she might be on her second, third or even fourth pregnancy, no two pregnancies are ever the same, and everyone’s body responds differently. Yes, even to the time before. Because you’re nurturing and growing a delicate foetus, it’s essential that when you’re pregnant, you only consume and use products that won’t harm an unborn baby. We all know that alcohol and soft cheeses are out, but you might also need to reconsider what you put ON your skin. Finding skincare products that are harmless to an unborn child yet still effective can be overwhelming. With harsh chemical ingredients in most moisturisers, lotions and treatments; how do you know what’s ultimately safe? Don’t lose hope! For all your pregnancy skincare problems, Biologi serums are the safe and 100% natural answer. If you’re pregnant, trying to conceive, or have recently had a baby, read on to find out how regular use of Biologi serums can cure all your pregnancy skincare complaints. Changes in hormone levels brought on by pregnancy can increase sebum production which can lead to acne. The more oil you produce, the higher the likelihood of aggressive spots and pimples. While there isn’t a product that can control the hormonal changes you’re experiencing through pregnancy, you can treat the acne itself. Some of the mainstream acne treatments contain strong chemicals and aren’t always recommended for use during pregnancy, so you need to find a more natural solution that still works. 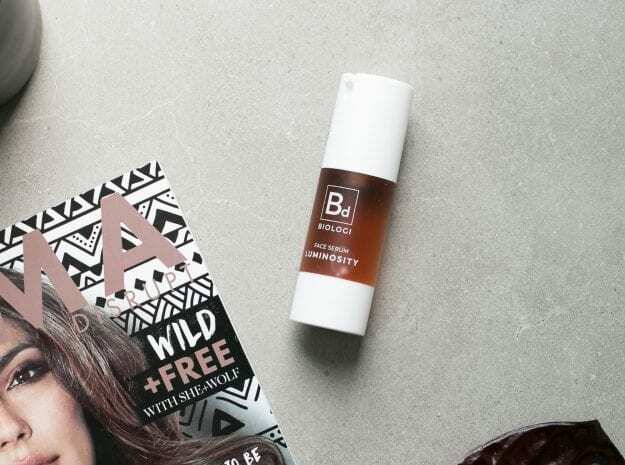 Bd serum is a twofold solution to hormonal acne. Firstly, it calms the skin with anti-inflammatories gallic acid and quercetin. Next, the enzyme exfoliation performed by tartaric acid helps to break down the protein bond that’s stopping your dead skin cells from dropping away. Regular use of Bd serum cleanses and clears away the blockages which control the oil flow reducing the occurrences of aggressive spots. During pregnancy, the change in hormones can lead to the overproduction of melanin (the pigment that causes us to tan when we go in the sun) which causes sporadic dark brown sun spots (pigmentation). One of the most effective treatments for hyperpigmentation is vitamin C. It works as an antioxidant to lighten brown spots, increase cell turnover and help stop the formation of new pigment. Our Bk serum contains natural vitamin C and by far the most potent product on the market. Pair this with Bd for its anti-inflammatory and antioxidant properties, and you’ve got a winning combination for the treatment of pigmentation. It’s impossible to avoid the fluctuation of hormones during pregnancy, but you can prevent the pigmentation from getting any worse and prepare your skin post-pregnancy to clear up faster and more efficiently. There’s no doubt that during pregnancy, women have to surrender control of their bodies. Along with the hormonal changes, the skin really gets a workout too with the weight gain caused by a growing baby and fluid retention. Stretch marks are often caused during times of rapid weight gain like pregnancy. The tearing of the deeper layers of the skin, can leave red blemish-like marks which may fade with time but won’t ever disappear entirely. To keep the skin as strong as possible and to avoid stretch marks forming, hydration and vitamin C are key. Bf serum contains amino acids that also provide better building blocks to firm the skin and reduce the risk of permanent scars. If you want a double action, our Bk serum contains natural vitamin C to boost your collagen production even higher and keep those stretch marks away! Once a woman conceives, it’s medically recommended that she avoids the use of retinoids which provide the vitamin A needed to keep fine lines under control. Swap out the chemicals and use natural vitamin C to reduce fine lines instead. Bk serum will help you keep everything plump as it stimulates the production of collagen and elastin. Because it’s 100% natural, it’s completely safe to use before, during and after pregnancy. Your body goes through a lot of changes during pregnancy and Biologi offers the first 100% natural, yet 100% active product to help clear up skin complaints. With just one natural ingredient in every bottle of serum, we don’t add any chemicals making the Biologi product range completely safe for mothers and their unborn children. Oh, and the best bit…they work! I freaking looooove my serums. Im 36weeks pregnant and with my first baby I had problematic skin. This time around I have had ssues with pigmentation and fine lines nd a bit of acne etc. But after two weeks using this as per instructions, all I have to say it, I will never use nother product on my face or body. The skin on my face and arpund my eyes have smoothed out and my skin tone is looking even anf glowy. It almost looks like I am wearing make up. I have a bunch of skin care products I am happy to let go of.